Darline Lindsey, beloved mother of Ralph Lindsey, Jr. and Brenda Kay Griffin, passed away at the age 84, on April 4, 2019. Visitation will begin on Sunday, April 7, 2019 and friends are cordially invited to visit with the Lindsey family from 5 to 7 o’clock in the evening at O.T. Allen Funeral Home, Alto. A funeral service is scheduled at 2 o’clock in the afternoon Monday, April 8, 2019 at Hilltop Baptist Church in Alto. Bro. Donnie Barron, Rev. Steve Edwards and Rev. Josh Lindsey will officiate. 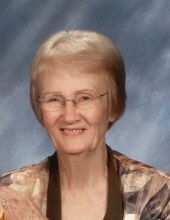 Mrs. Lindsey will be laid to rest at Old Palestine Cemetery. Pallbearers will be Ted Moore, Michael Lindsey, Aaron Lindsey, Paxton Lindsey, David Ruby and Brandon Barron. Honorary pallbearers are Bill Lindsey, Bob Cherry, Dwight Lyons, Jack White and Terry Ted Moore. "Email Address" would like to share the life celebration of Darline Lindsey. Click on the "link" to go to share a favorite memory or leave a condolence message for the family.